Im not a fan of looking straight into a laser, but sometimes you have to verify that the GBIC has the TX laser coming out of it. I usually will tilt my head to the side and ease my head in to see the laser. 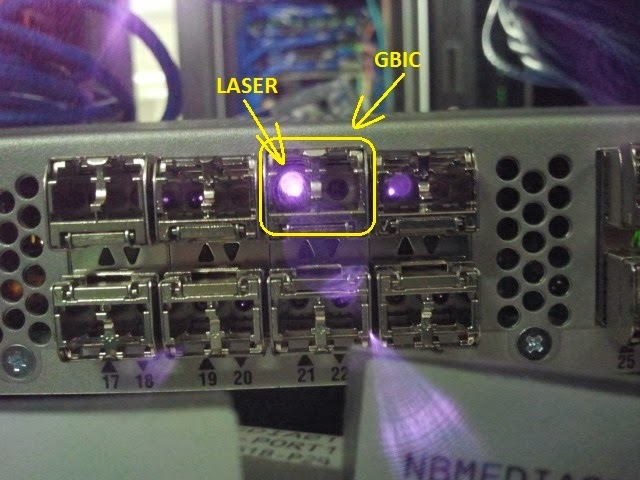 I suspect that looking directly into the laser is not healthy for your eyes, so one way of doing this is by using your smartphone to take a picture of the GBIC. That way, you can see if the GBIC appears to be working properly or not. Im just needing to check to see the laser is coming out, nothing else. The phone/picture thing works well.